Cruising the twitter streams this morning I noticed this tweet retweeted by +Koreen Pagano. A quick click on the link brought me to an article in the webzine Gamasutra. "...honoring someone who is helping video games "advance to a better place" through advocacy or action..."
First off, a big shoutout to Koreen for retweeting. And an even bigger shoutout and congratulations to Brenda for being so highly recognized by her peers in the gaming industry. Oh but wait...this is supposed to be a blog about eLearning and all that stuff. Don't worry. It still is. I believe there is a very strong connection between gaming and learning. One of my favorite quotes comes from Raph Koster's book "A Theory of Fun". "Fun in games arises out of mastery. It arises out of comprehension. It is the act of solving puzzles that makes games fun. With games, learning is the drug." Learning is the drug! It's such a great line because it's so true. There is such a great high that comes from working hard on a problem and seeing it through until you get it right. Knowing how learning is such a big part of games, and fun, it bothers me to continue seeing the eLearning industry struggle to figure out how to make learning fun. Game designers seem to have an innate ability to figure out fun, and yet instructional design is void of any discussion around fun. The closest we get is talking about "engaging the learner". I'd rather tell designers to figure out how learners can have FUN! And NO! I'm not talking about a Jeopardy template, or crossword puzzle, or drag'n'drop matching quiz game. That's what we get when we attempt to connect pre-made games with learning. I'm just talking about fun. There must be a way to create learning content that is so fun for learners that they WANT to "play", or "engage", with the learning. This entire blog post is really just an attempt to capture fleeting thoughts and memories for me. Seeing Koreen's tweet reminded me of meeting her for the first time at DevLearn. And how we all used to be so excited about the coming together of games and learning. Koreen even created the Zombie Apocalypse game for DevLearn2010. Other eLearning community members, Kris Rockwell (@KrisRockwell) and Alicia Sanchez (@gamesczar) later created a card game for mLearnCon called "A Game of Phones". 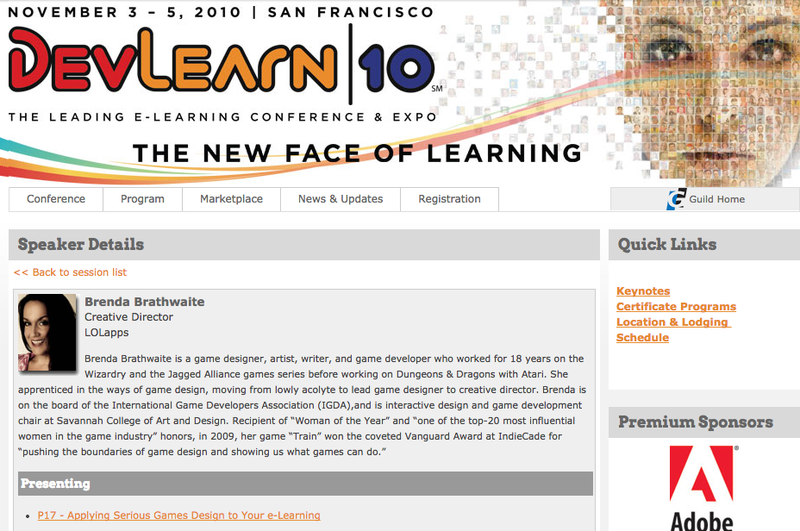 And reading about Brenda's success reminded me of booking her to do a workshop at DevLearn2010. I was only able to sit in on the workshop briefly, but I do remember wishing I could have spent the entire day in there with her and the other attendees. I booked a lot of speakers for eLearning Guild events, but I can honestly say she was by far my favorite. And quite frankly I think she does more for learning and education than most who are actually IN Learning and Education related fields. If you really want to know why I find Brenda so exceptional, then just watch her TEDxPHX talk for a brief glimpse into her work and how she views games...and the world. Trust me on this. You'll be glad you did.